VATICAN CITY (CNS) — Because scientists can never be neutral in their research, they must not be tempted to suppress the truth and ignore the divine, Pope Francis told health care professionals. “Openness to God’s grace, which comes through faith, does not weaken human reason, but rather leads it toward knowledge of a truth which is wider and of greater benefit to humanity,” he said Aug. 31 in an address to experts taking part in a world congress on cardiovascular research. More than 32,000 professionals, including cardiologists, from 120 countries attended the weeklong gathering in Rome. Organized by the European Society of Cardiology, the annual congress seeks to exchange the latest and best practices in research and patient care. Pope Francis, who traveled to the congress venue on the outskirts of the city, insisted that no one be denied proper medical attention and care. By recognizing the full dignity of the human person, one can see that the poor, those in need and the marginalized should benefit from the care and assistance offered by public and private health sectors, he said. “We must make great efforts to ensure that they are not ‘discarded’ in this culture, which promotes a ‘throwaway’ mentality,” he said. Church teachings have always supported and underlined the importance of scientific research for human health and life, he said. “The church understands that efforts directed to the authentic good of the person are actions always inspired by God,” he said, and caring for the weak and infirm is part of God’s plan. However, “we know that the scientist, in his or her research, is never neutral, inasmuch as each one has his or her own history, way of being and of thinking. “Every scientist requires, in a sense, a purification; through this process, the toxins which poison the mind’s pursuit of truth and certainty are removed” in order to gain a greater understanding of reality, the pope said. 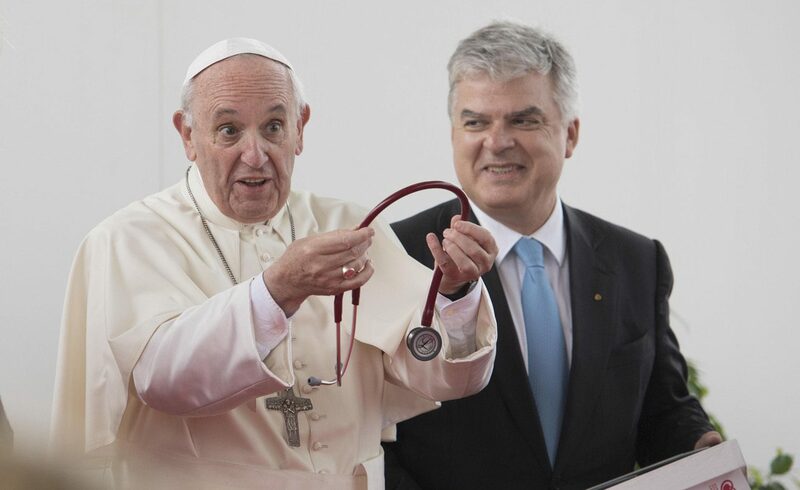 At the end of his speech, the pope was presented with a stethoscope and a cross made from laminated marble heart-shapes.